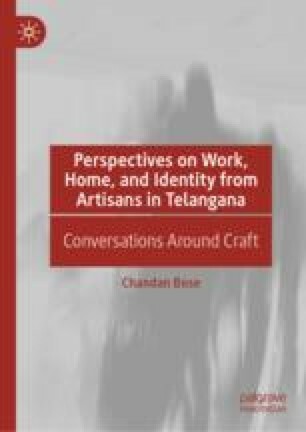 The first two chapters of this book narrate the way in which experience of craft is first the experience of a lived and embodied practice. The chapters dwell upon the historical language which artisans construct to articulate their experience of materials, materiality and different stages of the physical process of making. While locating the practice through its said/remembered and unsaid/tacit details, these chapters appreciate that a description can never exhaust or consume its subject; what it can do is only allude to moments that transpire during the encounter between the ethnographer and the artist.